A 24 hour emergency dentist in the neighborhood could prove to be very helpful if you happen to require dental services at an odd time. They usually tend to the likes of chipped teeth, gum or jaw pains and even knocked out teeth. However, if the occasion arises, they could also perform other dental surgeries to relieve their patient from discomfort and pain. The perfect place to visit if you are into rodeos and cowboys, Abilene contains over 120,000 people. Founded in the 1880s, this region is home to the renowned Paramount Theatre. Over 24% of the population is under 18 years old, which means the number of visits to the dentists could be quite high. This could be due to the high consumption of candies, sodas and junk food. Thanks to the emergency dental care units around this area, such problems could be handled with care and ease. Call at 888 988 4066 to get in touch with the Familia Dental team who are famous for their unique way of giving back to their patients. They have a Mobile Dental Unit, which includes a visit from one of their dentists, just outside their office, at the convenience of the patients. You could schedule a Dental Presentations or Education Day to help your children and family learn all there is to dental and oral hygiene. Started in 2008, the Familia Dental has to be one of the most fun-loving dental care units of all time. Call at 325 698 3384 to reach the chamber of Dr. Stan Turner, a dentist who is sought out for his expertise in the field of dentistry. Dealing in orthodontics, family dentistry and other forms of dentistry, Dr. Stan is known for easily tackling dental problems for patients of all age ranges. 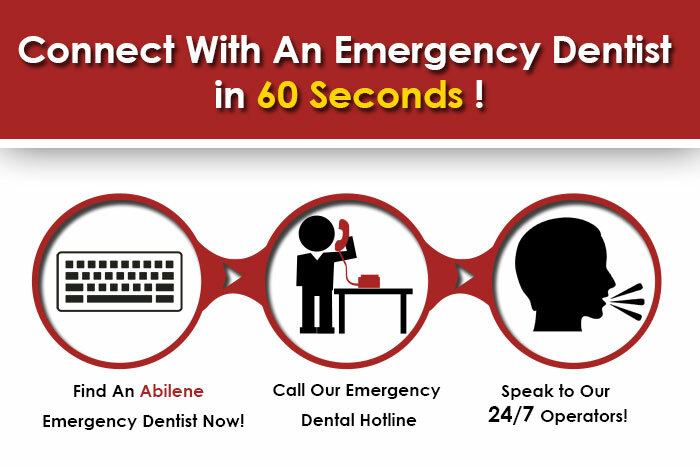 Welcoming patients from not just Abilene but even other regions, the Abilene Advanced Dentistry center could be reached via the number: 325 692 3332. The team encompasses professionalism and grace when it comes to doing their job. Their website includes an online appointment form, which is uncomplicated to understand and fill in when you require an appointment. The Abilene Advanced Dentistry team promises to give you an introductory tour around the office once you go in for an appointment. Be it about perfect dental implants, effective crowns, thorough oral examinations or safe extractions, the Abilene group is professional at all times. Led by Dr. Jeff Webb, this dental care center could be reached through a call at 325 672 2794. They make it a point to discuss your dental or oral problems before suggesting effective treatment options. In this manner, you are fully aware of what procedures are being done upon you. That is not all, the Abilene Family Dentistry actually contain educational videos regarding dental and oral problems and hygiene.